Magnificently Crafted and Decorated! 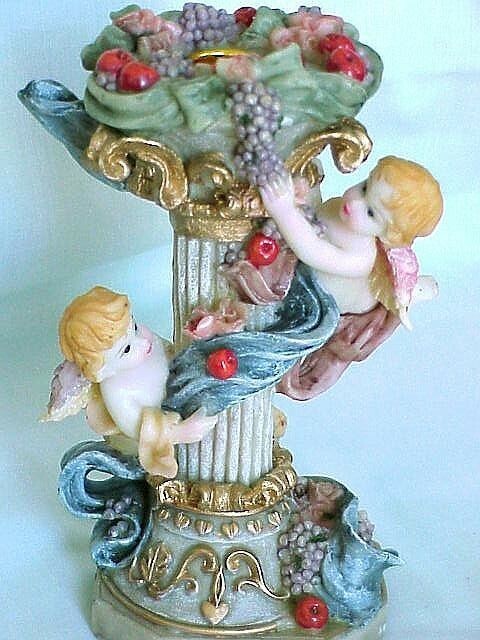 That Resin Candle Holder Angels makes an adorable decoration for your home or office! A Heavenly accent for a mantel, shelf or tabletop. Angels have incredibly detailed resin face. Angels are soft cream color with soft blue and green wings, and gold hair. Candle holder has all around 3D detailed hand-painted flowers and fruits, and edged detail in gleaming gold-tone as seen in the picture. It measures 7" x 4" x 3". A great gift idea for angel lovers. Brand new in its original box. You'll be amazed every time you see them! I have limited supplied...so, get yours now before it is sold out! Shipping and handling I accept PayPal only. Please checks; they will be returned. All my items are BRAND NEW and professionally packed, and shipped to you. Please visit my current sales at Bonanza. I will gladly combine shipping on any and all items that can be safely shipped together. I will ship immediately using delivery confirmation, after receiving payment. Please feel free to ask questions about sale prior to its ending. I look forward to making your experience a happy one. " Thanks for considering this item " Pay me securely with any major credit card through PayPal!